Pink Above Pink, 1965. Collage on cardboard panel, 62 x 47 cm. Richard L. Feigen. Autumn Painting, 1965. Collage on cardboard panel, 58 x 58 cm. Richard L. Feigen. Ray Johnson, dean of the non-profit (Art and Artists, April '66), says 'You can't send someone Valentines for 10 years, then submit a bill.' 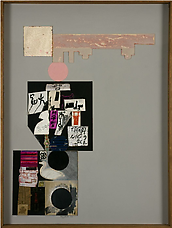 Consequently, he is driven by economic necessity to exhibit marketable collages that are often exemplary and which he considers to be his serious, high art anyway. His new works at the Willard Gallery are larger in size if not in scale and far more painterly. Better than the overworked pictographic, paper-strip collages in his last show, the new works feature few of his well-known graphic devices (temple domes, snakes, striated discs). But there still hovers about his work a 1930's aura of furtive, introspective poetry, a self-conscious creative expression calling attention to its own refinement. Johnson endlessly rearranges and resurfaces his bits of painted cardboard until they fall into a tight mosaic with uniform patina. 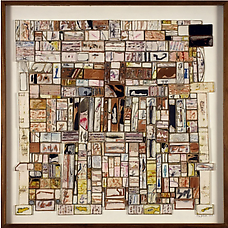 In the best of his new collages, each cardboard fragment (about the size of a commemorative stamp) has been painted, rubbed and sanded until it appears unspeakably worn and lustrous, like a chip of antique glass, a flaky medieval illumination, an Italian candy wrapper, a rained-on sand painting, or the sunbaked output of a diarrhoetic pigeon. Bourdon, David. “New York: Our Period Style." Art & Artists 1:3 (June 1966).